In the past few weeks I have been looking at the potential for sustainability in oil and gas production in Russia, now producing at a predicted recent peak of 10.36 mbd, when condensate is included. But the question increasingly becomes whether or not Russia can sustain these levels through this decade, as has been assumed by those suggesting that there will be no supply problems in the near future. 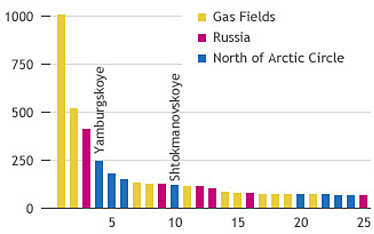 In order to sustain this level of production, against falling volumes from the current major sources in Western Siberia (estimated as 300 kbd in 2010 ), Russia is so far relying on bringing new fields into production in Eastern Siberia and Timan-Pechora (as well as some increase in condensate as natural gas production continues to increase). However these developing fields, as a broad generalization, are at a size of about 500 mbd each, with an anticipated maximum individual production level of around 150 kbd. (Prirazlomnoye for example, which is coming on line has 526 million barrels in reserves, and will be producing at 132 kbd). 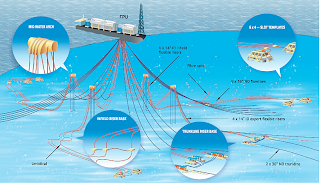 Prirazlomnoye drilling rig representation (Gazprom). 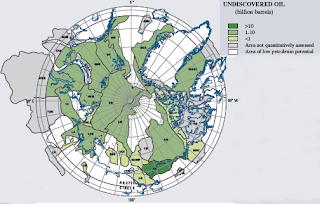 Since the high flow rates will likely not be sustained for long intervals, and declining production in Western Siberia will continue, so Russia will need to continue major programs of development to find further fields to bring on line later in the decade and beyond. In addition the declining production in other fields (which might increase overall decline in existing production to 5% or more, i.e. above 500 kbd) will add further pressure to sustain current levels, particularly given the criticality of oil and gas income to the Russian Government. With much of the land already surveyed, the potential for large fields lies mainly offshore, and particularly in the various national continental shelves and the disputed underwater territory between them in the Arctic. 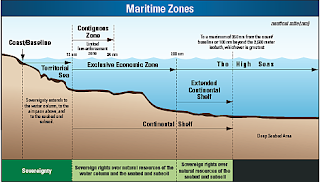 It is a region where there are multi-national concerns and involvement, with the USGS having previously estimated that it is home to about one-fifth of the world’s undiscovered, but yet recoverable oil and natural gas resources, an estimate, at the time, of 44 billion barrels of oil and 1,670 Tcf of natural gas. 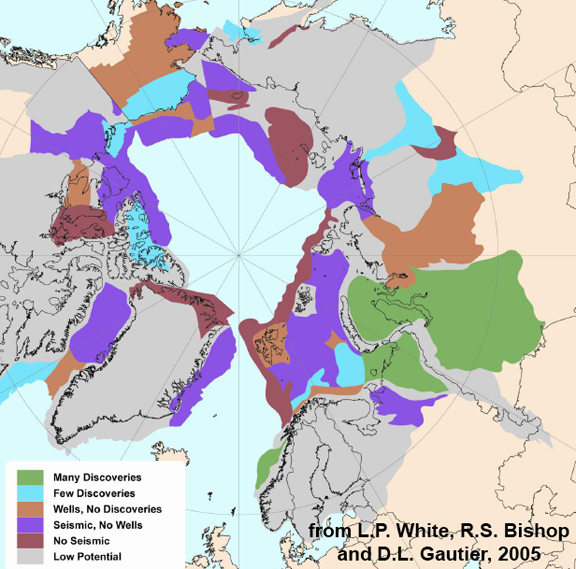 From the US perspective the US Bureau of Safety and Environmental Enforcement ((BSEE) seems finally willing to let Shell begin exploratory drilling in the shallow waters of the Chukchi Sea, although there has been a challenge to the recently awarded air Permit from the EPA. At the same time that the USGS is set to issue a new report that projects that shales on the North Slope may hold as much as 80 Tcf of natural gas and 2 billion barrels of oil, with initial drilling to prove the reserves anticipated to start this year. But those developments are on the other end of Russia, to the majority of current developments. The recent discoveries by Statoil off the Norwegian coast and in the Barents Seas(at Skrugard-Havis, and Aldous Major South, show the potential that still remains in the North. Roughly a third of the world’s largest gas fields lie north of the Arctic Circle with Russia having significant reserves among them. 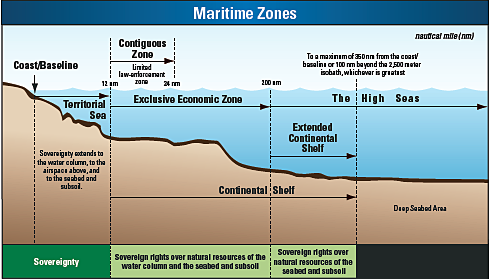 Russia is therefore moving toward a planned program of development of the resources off its own continental shelf, where it is expected to be able to produce up to between 0.8 and 1.6 mbd of oil production and 18 to 20 bcf/day of natural gas. Part of the problem, however, is going to be cost. The new program is expected to cost some $216 billion, at a time when the investments in developing the current projects in Yamal and Eastern Siberia are also demanding large investment, if those goals are to be met. TNK-BP are spending $12 billion to develop the Russkoe, Suzunskoe, Tagulskoe, Russko-Rechenskoe, and Messoyakhskoe fields in the Yamal region, with the hope that these can contribute at the end of this decade, and into the next, at a total level of around 300 kbd. Suzunskoye is targeted to begin production in 2016, running at around 100 kbd once on line. Russkoye is projected to start in 2017, and produce 150 kbd of a heavier oil. Tagulskoye and Russko-Rechenskoe will come on line in 2019. Messoyakhskoe is a joint project with Gazprom and (at $17.3 billion cost) will not come on stream until 2024, at 320 kbd. These fields will, however, feed into the pipelines that head East, to China, Japan and Korea. 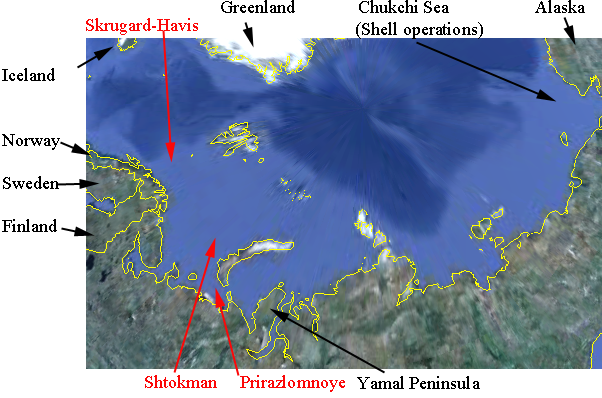 Closer to Murmansk Exxon Mobil and Rosneft are exploring blocks in the Kara Sea anticipating that it may ultimately cost $500 billion to develop reservoirs in the difficult conditions with moving icebergs but for now expect that initial exploration and development will cost in the $10’s of billions. Perhaps, of these fields it is the Shtokman natural gas field, which lies under the Barents Sea, 550 km north of the Kola Peninsula which has drawn most attention. Currently expected to start production in 2016, costs may well run over $15 billion. Shtokman was discovered in 1988 (the name comes from Professor Shtokman who gave his name to the research vessel that found the field and contains an estimated 85 Tcf of natural gas, as well as around 400 million barrels of concentrate. It lies under 1,000 ft of water, with the interesting occasional problem of visiting icebergs that can weigh up to 4 million tons apiece. Planned to come on line in with an average production of 2.3 bcf/day, the supply (as the above map shows) half the supply is anticipated to feed into the Nord Stream pipeline for shipment to Western Europe, while the rest is converted to LNG and will be shipped out by tanker. Gazprom has recently increased the area of its license rights for the field, with a new date for commitment set for this month. 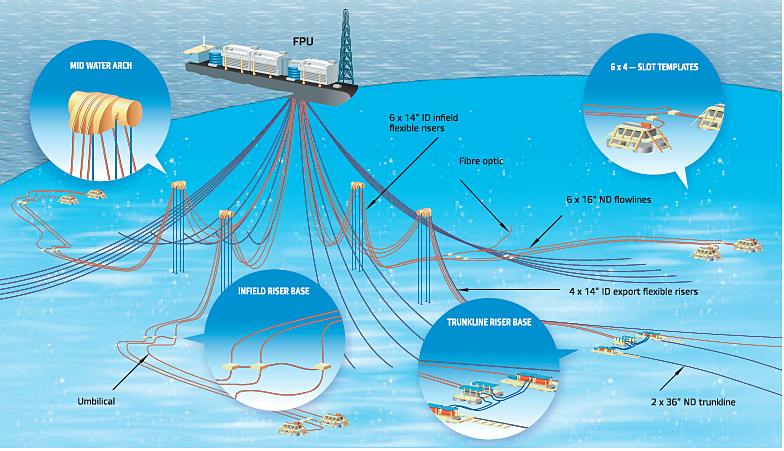 The current intent is to use a series of buoyed risers to connect from the wells to the surface, so that, should an extra-large iceberg appear the Floating Production Unit (FPU) can detach and move out of the way – should tugs not be able to divert it. The pipeline shipments are planned to begin in 2016, but the LNG shipments (some 7.5 million tonnes a year) will not start until 2017. 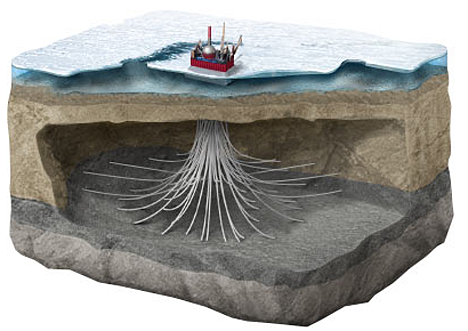 The project is a joint venture between OAO Gazprom, Total S.A., and Statoil A.S.A. The point however, is not that there is going to be no more oil, it is just, as the production schedules above illustrate, that it is going to be slow and expensive to develop that which remains. Over the next decade Russia will have to bring three or four new fields on line each year at around 100 – 150 kbd each, if it is to sustain production at current levels. It is somewhat difficult to see them being able to hold to that schedule, even for a year or two. I am British and used to be in the oil industry. I know a number of people who believe that Russian oil production is on an inexorable slide down. They need technology from western sources, but are unwilling to give them the terms to make them feel comfortable investing in that country.